First, a clarification to set the the minds of those who trooped here to slap in my face the fact that I am a poor little guy, who couldn’t afford a car, and falling back to a motorbike as an excuse. You’re right. Here you go! If yes, please go on to close this page and move on with your life. To the rest of you interested in reading how using a Motorbike in Accra to commute will save you lots of money each year, with a load full of risk and danger, you’re welcome. Accra is chaotic. This saying, by now our fellow Lagos, Nigerian friends are laughing so hard. To them, if Accra is chaotic, then Lagos is not just chaotic but rather, a synonym of chaos. So a sentence like, ‘I went to Accra and it was full of chaos’, would be, ‘I went to Lagos and it was full of lagos’. I have done an article already on the Cost of Commuting in Accra – The Solution? where I discussed the use of Motorbikes and Bicycles as a very viable and potential means of cutting down cost (and time) of travel in Accra. Read the article, The Cost of Commuting in Accra – The Solution? It is easier to whine about how broken the transportation system in Accra is. As Ato Ulzen-Appiah would always tell, “Less talk, More action”. One of the means to act is finding means to individually cut down on our commute times. And I just did so in a significant way by getting a brand new Motorbike. In this article, I’ll share the dangers related to motorbike usage, which are obvious, especially in a chaotic environment like Accra. Tips on how to ride safely would be thrown in the article along the line although as safe as you are as a rider does not entirely mean that stupid driver ahead, behind or flanking your sides will be safety-conscious. 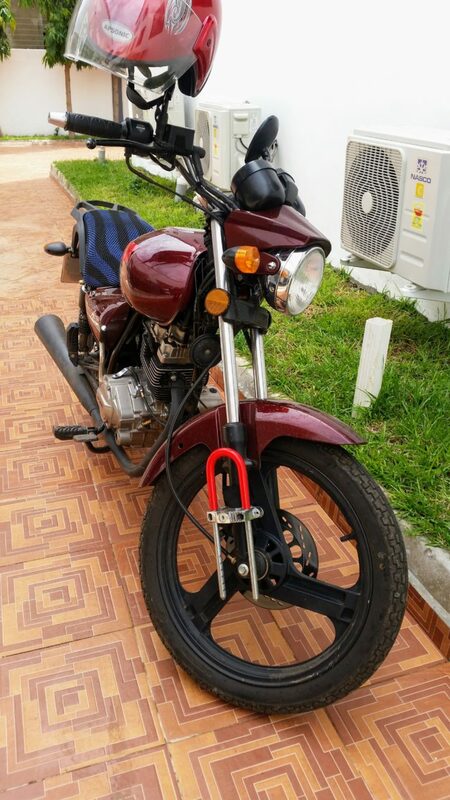 Then finally, will share my experience so far with my Motorbike as means of transport in Accra, the time and money savings. Plus on top of all, the convenience. I think that heading contains enough of the section and more words wouldn’t be able to emphasis the safety concerns of being on a motorbike any further. It is risky and dangerous. No questions asked. Hands down. Period. One’s chances of survival is as minimal, and if you ask me, closer to zero than even to 20. I’ve been riding motorbikes since 2011. I’ve fallen a couple of times, fortunately none fatal or seriously injurious. The next time you meet me, see if you can spot a scar on me, celebrating one nasty crash I had some time back, using a part of my skin as the billboard for the announcement. Although one could say I have experience and perhaps considered an expert, with more than 700 riding hours under my belt, there isn’t any day I sit on the bike not considering it my last chance of breath. A million things could go wrong, even when travelling at 20km/h on the bike. See. Even if everything on your bike is 100% intact and effective, a car from behind could knock you down, invalidating all the robustness of your bike. A friend, Tinagyei, narrated a similar incident that happened recently. In short, motorbikes are dangerous, and not because everyone loves to just say that, but the stats support it. I can’t stress enough how unsafe being on a motorbike is, and can be. For many of us, we dwell as much as possible on how best we can remain safest on the road. If that involves ‘thinking for every driver’ on the road, then yes, we will! I’m not sure any accident between a car and motorbike, the driver will feel any damage. Even a motorbike and a pedestrian accident, although the pedestrian will sustain major injuries, depending on how the accident occurred, the rider could ‘enjoy’ fatalities. A ton of info out there already go into detail all the nitty gritty things you can, and should do to protect yourself as a rider, always. I’ll pick only two which are my favorite and touch on for now. In other words, always, always, always let the traffic around you – ahead, behind and flanking your sides – be aware that you’re there. Drivers don’t give a … about motor riders, especially in Accra. In Den Hague, Netherlands, the way pedestrians and motorbike riders had priority on the road; such level of respect for riders isn’t remotely available in Accra. The ordinary driver on the road don’t even care about a fellow driver in a car, thus how much more you the one on a two-legged speeding device! How do you announce your presence? It can be timely hornings as you go. When it’s getting dark, or in the night having your headlight and tail light on always is key. Drivers associate (by default in many cases) both trafficators blinking as a sign of “something is wrong”. Who wants to come close to someone or something that is wrong? And it announces your presence. As it blinks, it draws attention. Naturally, subconsciously, drivers will give attention, even if they didn’t want to, a little bit of thought about what is following or headed towards them. Your headlights can do the presence-announcing job too. In union with your horn, use the headlights to talk. Overtaking a car in the night? Flash your high headlights before you initiate the overtaking. If needed, horn in addition. And make sure to overtake as quick as possible, before God-knows-what possesses the driver to turn left as you overtake, knocking you off the road. If you can think of other measures to announce your presence, please always do. Any little, helps! That little horn or blinkers could mean you get home alive, or ‘go home’ in burial! It’s something out of this world, to see riders with their helmets locked at the back of the motor as they speed through traffic, not wearing a helmet. If you’ve not seen a human head split into two before, and wouldn’t wanna see one, guess what, we don’t wanna see yours too. The helmet of course won’t save you from broken bones or your skin tearing apart, however, in cases where you could have escape, a simple hit of the head on the road or a concrete will kill you instantly. No questions asked! Next is a protective jacket and booths. Depending on how you fall, your feet (one of it) could become a Chupa Chups for the finely tarred road to munch on. How sweet it’ll be! Your feet in booths is essential. Remember the nicely designed scars I have on my skin as a result of my motor accident? If I wore a protective jacket that day, I would have walked from the accident without a scratch on my skin. It wasn’t the type of accident I could die from, but the kind that had the potential to get disfigured. And my brethren and sistren, disfiguring isn’t something you wanna have in 2018, at least intentionally. 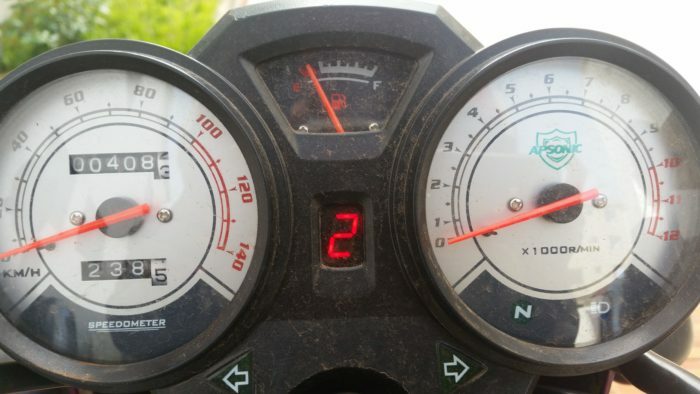 How fast you’re travelling plays a huge role in your survival chances as you ride. In any event of an accident, you want to reduce the impact of you hitting the ground or the opponent object. For town rides, going above even 60km/hr is risky, and the haphazard of traffic can make any collision dangerous. Going quick bursts of speed especially for town roaming would not get you to your destination any faster, since you would still slow down at speed rumps or stop completely at traffic light intersections. Imagine traveling 100 km/hr only to stop at the next traffic light. The other motorider traveling at 50 km/hr would get to you at the travel light intersection in under 30 seconds. You don’t want to unnecessarily put yourself at high risk for absolutely no extra advantage or reason. Just be reasonable. It takes me, for instance, 30 minutes to get to work from home. That’s the slowest means I could go (average of 40 km/hr). But should I wanna go the fastest? The time difference would be just about 10 minutes earlier, however that would mean I rode very recklessly. Keeping safe, obviously far outweighs savings of 10 minutes. So to compensate for any unforeseen situations, I give myself a maximum of 40 minutes windows each morning as my commute time. Some days I can get even 20 minutes, when traffic is very minimal. But with such timeframe in mind, I ride calmly, relatively, reducing the risk of accidents being caused as a result on my part. In summary, announce your presence; let other traffic on the road know you too ‘dey’, you’re there some. Kill your speed, before speed kills you; Ahead of Time (AoT) planning can save you from rushing and getting yourself hurt. And wear protective gears as you slide through the air on your motorbike. The motorbike is an Apsonic. They say the horse power is 125 something something. Not really into knowing Motorbikes like the back of my hands. My primary concern usually is the bike being in good shape and able to take me from point A to B efficiently. Not the David Harleyson type of bike you were expecting to see, right? Sorry to burst your bubble then. Anything more I could say about the bike? Naa. Not at the moment. It’s just a motorbike. Nothing more. Now the fun part. First, the costs I’ve incurred. As we break down the savings below, one recurring cost of the motorbike is fuel. For every 450 km covered, I will spend 60 Cedis of fuel. That’s roughly twice the distance from Accra to Kumasi. That’s 7.5 Kilometers per 1 Cedi spent. So here are how I’m saving. Transport fares, Monday to Friday, 10 Cedis (at least)* each day, that’s 50 Cedis. In a month, that’s at least, 200 Cedis. The above is only commute cost. Going to Koforidua, or meeting friends at different places within Accra, the cost of transport in such scenarios aren’t covered. * I say at least, because depending on how choked traffic is on my route, I used to charter a taxi to cut my time travel short by using an alternative route. I spent a least average of 2 hours hours each day commuting. Let’s put everything together and do the yearly math. That’s 12,000+ Cedis worth of time spent each year. Now that above is how much I, someone who stays at Christian Village, commuting to work at East Legon, would incur each year. Imagine someone staying at somewhere Weija, commuting to work at East Legon or Airport Area. The numbers may begin to add up. Even if the person’s time is worth 1$ per hour, there’s still a time price to pay. Do the calculation yourself. See the calculator here: How much worth am I? 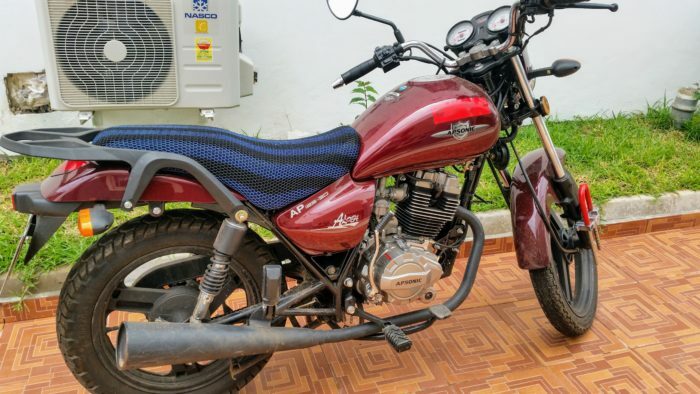 After giving the thought of using motorbike for a while, as it stands now, it seems to be a decision that has the potential of saving me lots more time and money in the coming months, streamlining my movements and punctuality. I hope you found this piece useful. See you in the next one!